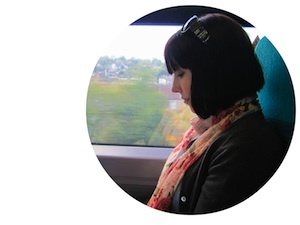 There is nothing quite like a visit from the past, especially when it pops up unexpectedly. If you’ve never been to a Japanese or Chinese tea house, it’s one of those things that must be done at least once in your lifetime. 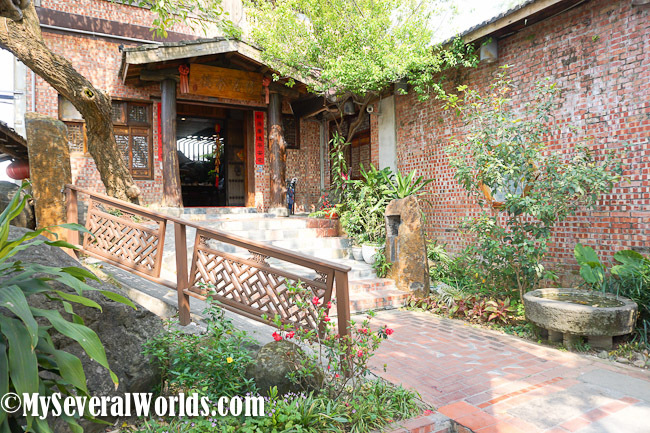 Step back into time with me at Jwu Jiu Teahouse in Chiayi in Taiwan. 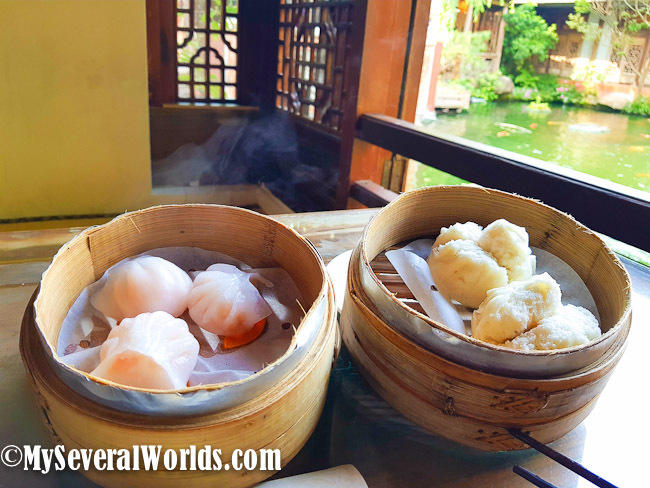 This authentic Chinese teahouse is set over a koi pond with a stunning garden view, complete with red paper lanterns, soothing music, and some of the best tea time dim sum snacks I’ve ever had in Taiwan. 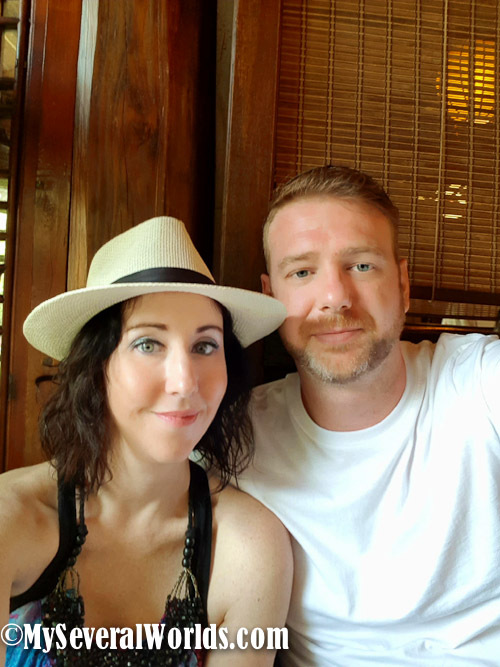 We stumbled across this magical place over a decade ago on a road trip with John’s mom and our son Caleb. Back then, they didn’t even have a business card, and every time we’ve passed by Chiayi in the years since that magical night, I’ve often wondered if I’d ever see it again. I’ve been to Chiayi many times and there are some wonderful things to do in Chiayi, but you can’t imagine how frustrating it was to leave this restaurant without a business card or any information on how to get back! I’m so glad they had a business card this time and that I can share this moment with you now. I’ve only been waiting for a decade to tell you about this incredible find in Taiwan. 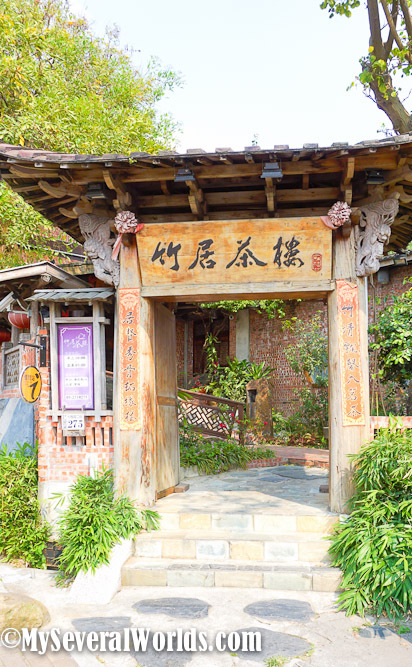 Chiayi is a city that is rich in cultural heritage. It is known all over Taiwan as the City of Paintings, and this is no small surprise given what the city seems to have been built for nature lovers. 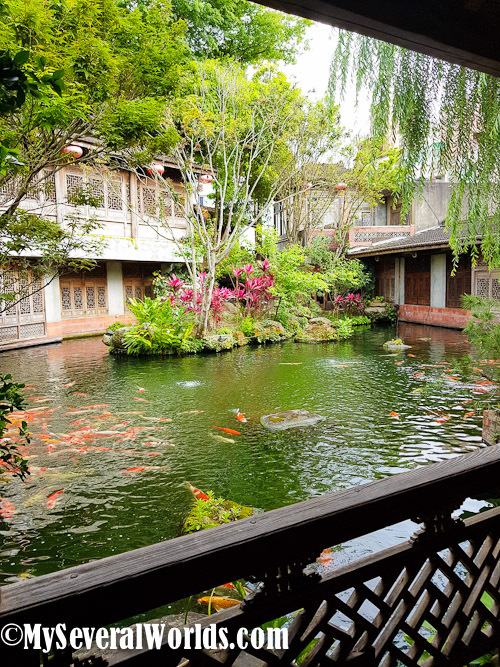 If you’re looking for a big city scene in Chiayi, you won’t find it in sleepy Chiayi, but you will find yourself close to nature. 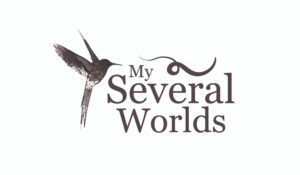 You can ride around the city by scooter or bicycle, explore the lovely parks, lakes, and temples, and the mountains, as I mentioned, are nearby. It offers easy access to hiking because of its close proximity to Mt. Ali, which is one of the biggest mountains in Taiwan. Jwu Jiu Teahouse opened in October 1999 as a dim sum restaurant. 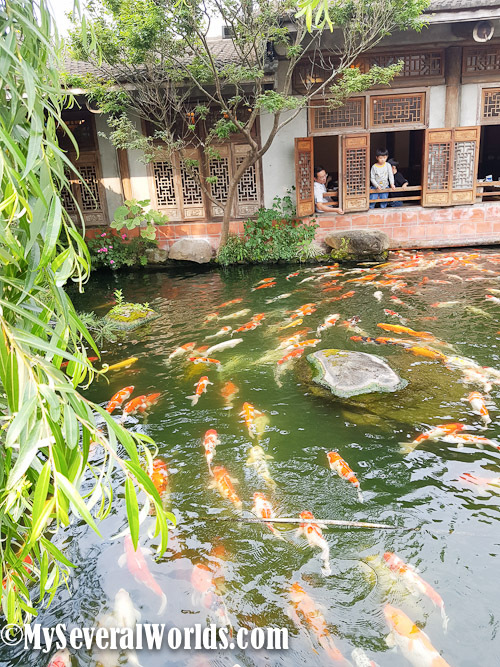 It has one of the prettiest Koi ponds I’ve ever seen in Taiwan with a natural indoor waterfall and plenty of authentic and original pieces of artwork for nature lovers. 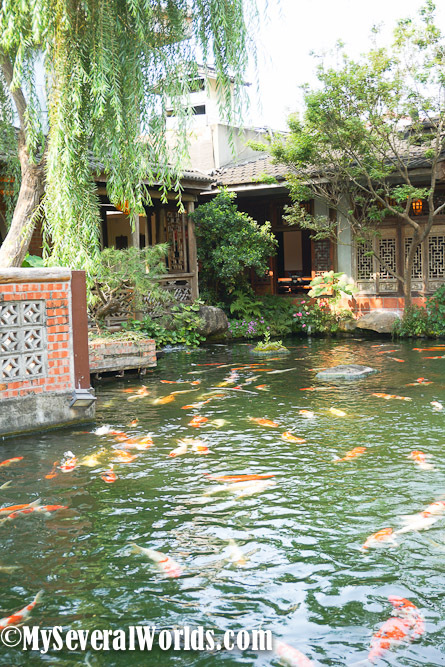 The restaurant is wrapped around a Chinese garden complete with rock and stone formations, a tiny Koi pond, a waterfall, and as much tea as you’d like to drink. 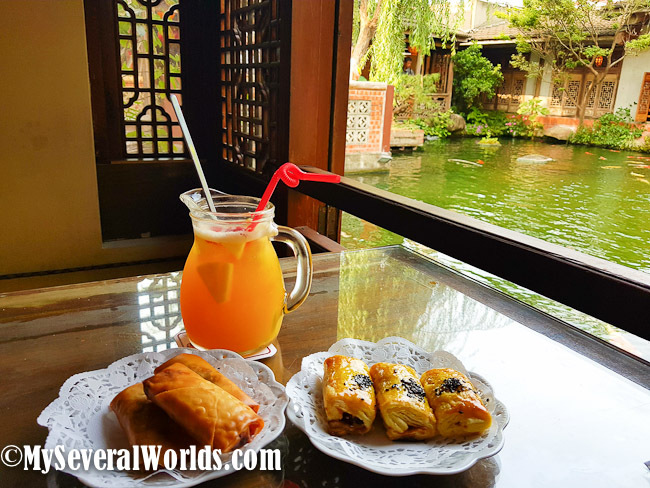 Visiting Jwu Jiu Teahouse is like stepping into a Chinese scrolling painting with carefully painted scenes. Cue my wonderful husband who seems to have his own personal GPS in his head. As we were heading back from a long weekend in Kaohsiung, we were getting ready to drive by Chiayi and John asked me if I had enough energy to see if we could find it. He received an instant yes from me. 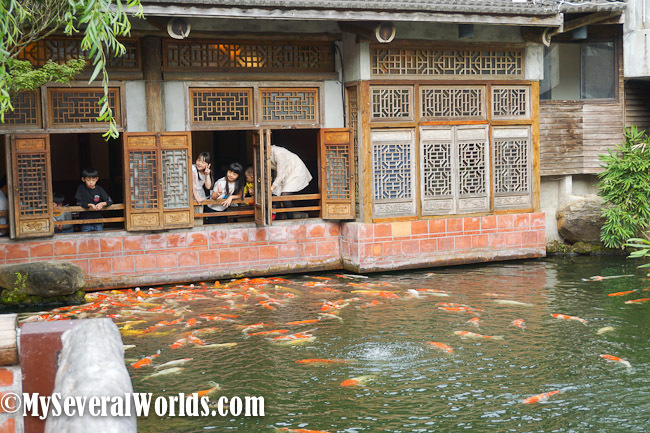 Of course I want to see those giant koi again and look out over the peaceful water with the graceful swaying trees. A cup of tea sounded delightful, and so did more than a few things on their massive menu. 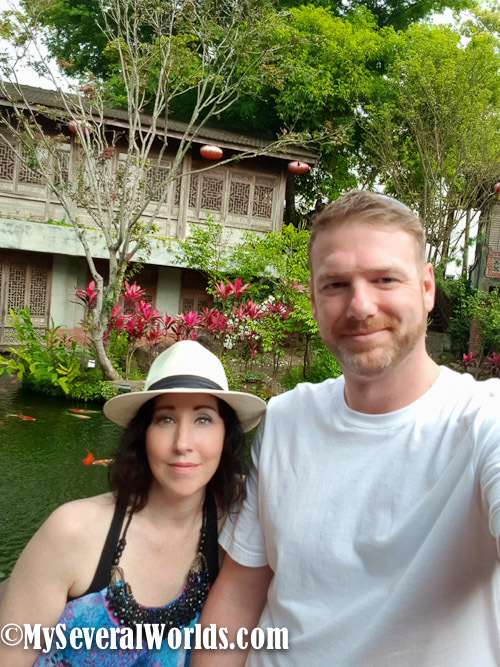 The last time we visited this place was at night, and it’s quite a special site to see the garden lit up with koi swimming right up to your window, but this place becomes ethereal during the daylight hours. It’s like stepping back into time. 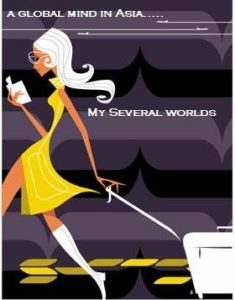 The delightful things about this place make it truly unique. As soon as you step foot past the wooden archway, the sounds of traffic fade away and the flow of running water and scent of blooming flowers makes you feel a little heady with the joy of being in such a serene and perfect moment in time. The front entrance has an indoor garden complete with a rock waterfall and lots of natural light for things to bloom and grow. The circle of life goes round and round. The patterns that the koi created in the water were truly a special site to see. 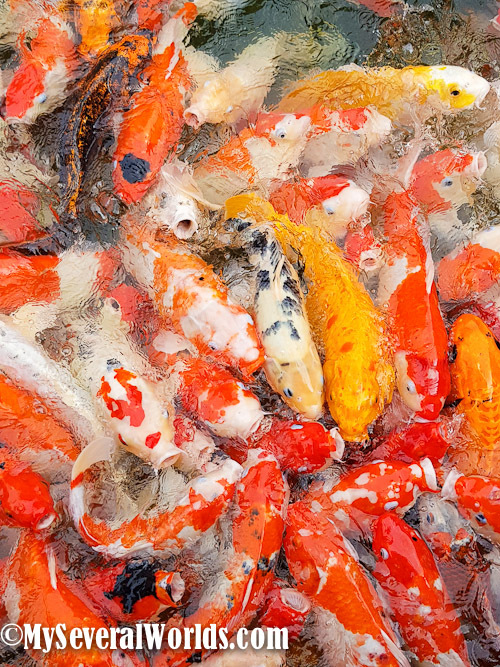 Koi are a type of fish in Chinese culture that symbolize good fortune, success, prosperity, longevity, courage, ambition, and perseverance. These fish have a powerful and energetic life force which is demonstrated in their ability to swim upstream and against currents. They are a symbol of Chinese culture that are depicted in artwork, clothing, and tattoos. These fish are revered by many for their magical properties of life. In feng shui, the koi is tied to the yin yang symbol. The black and white tear drops of the yin yang symbol are said to represent two koi, one male and one female. 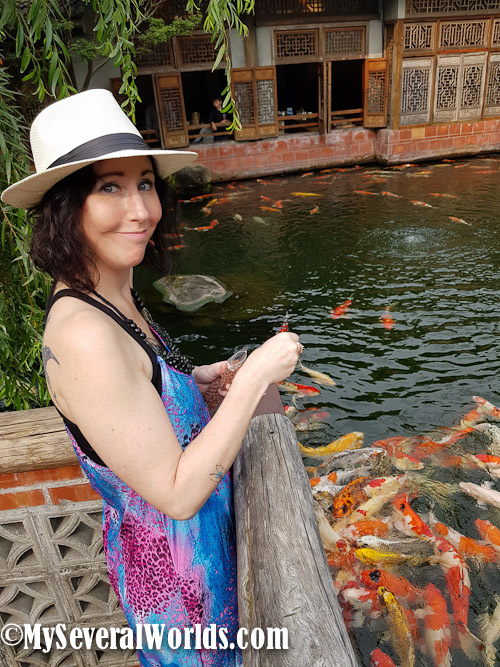 Koi are synonymous with harmony and happiness. The two koi in the yin yang symbol complete each other and create a perfect balance of positive and negative energy. During my time at the teahouse, I was keeping my eye on a few different colored fish. I was able to catch a good image of the silver koi I had my eye on. It wasn’t until later that I looked up the symbolism of silver koi, also known as Ogon. I’m glad I had my eye on it because it symbolically represents success in business and wealth. I’m sure John will be pleased to learn that when I tell him that. (There’s my yin yang symbol in real life. Those white and black fish stood out against all the others.) I was also very drawn to the black koi and the ones with white bodies and black spots. I found out later that these are called Kumonryu and they symbolize life changes and transformations. The fish were truly speaking to me that day! 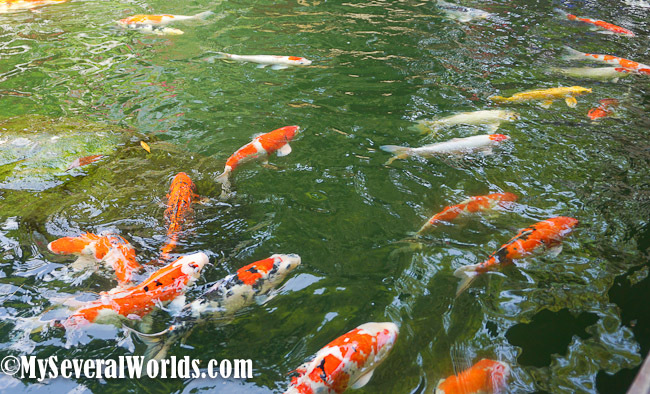 Koi that have a white body with red spots are called Kohaku and they symbolize success in your career. White and red patterned koi are called Kuchibeni and they represent love and long lasting relationships. We saw plenty of those. They’re also known as lipstick fish because the red coloring around their lips looks like they are puckering up for a kiss. 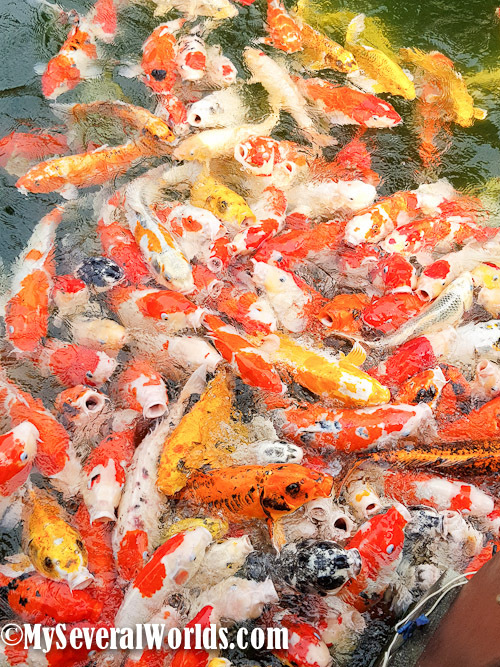 Gold colored koi symbolize wealth and they are called Yamabuki. 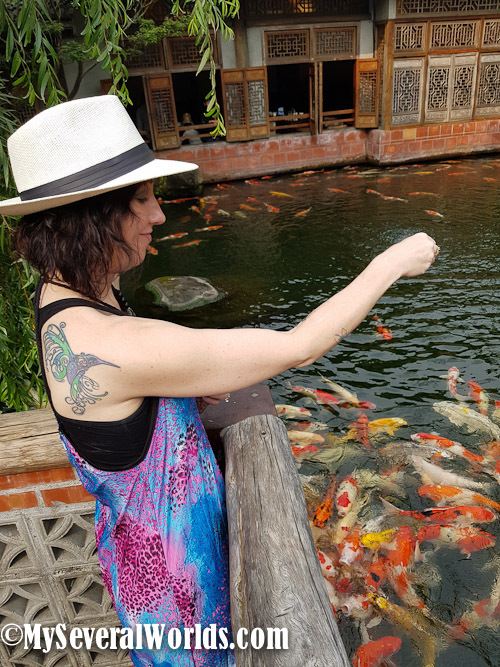 And to think that just two days before I visited this teahouse, I had decided at the 9th Annual Kaohsiung Tattoo Convention that my next tattoo will be a koi tattoo. It’s like it was meant to be. 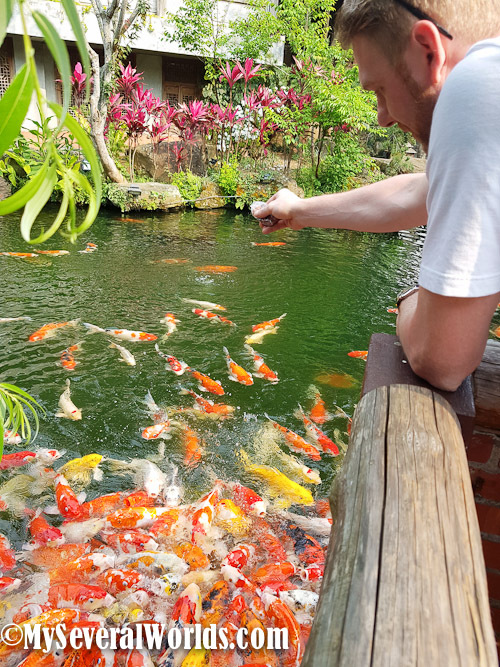 John wanted his chance to feed the fish as well. He created a feeding frenzy right at my feet after we left our window table. Of course, I didn’t do nearly as good of a job. I was happy enough to let him round the fish up while I gazed on in delight and tried to keep track of my favorites. If I’m going to use my energy to stand for something, I’ll gladly stand for these gorgeous koi any day. I hope they worked some sort of magic on me. 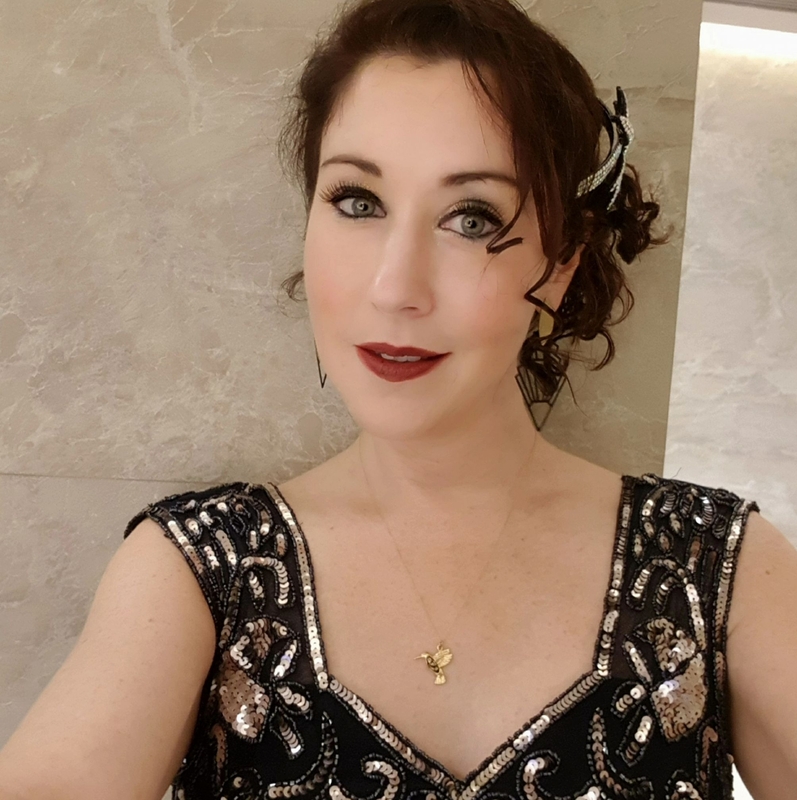 I’m counting on my silver fish and the black fish I had my eyes on to live up to their expectations and send me good luck in transformation, change, and in wealth and business. The food at this restaurant is really good. If we lived in Chiayi, I’d probably spend a lot of time here. The most expensive items on the tea menu are the types of tea. I ordered some cold fruit tea while John had a coffee. 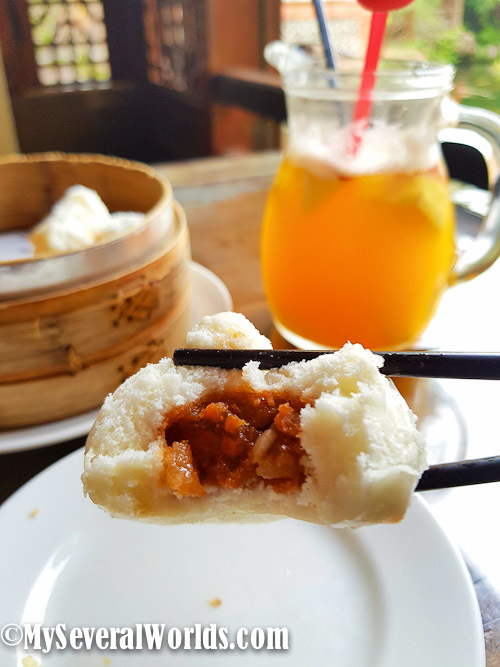 The steamed pork buns, also known as Char Siu Bao (叉烧包) have always been a favorite. I love to order them at dim sum restaurants and tea houses, so John let me have this order all for myself. And even though I can’t eat bread, I enjoyed every single bite of this wonderful sweet and salty buns. Heaven! 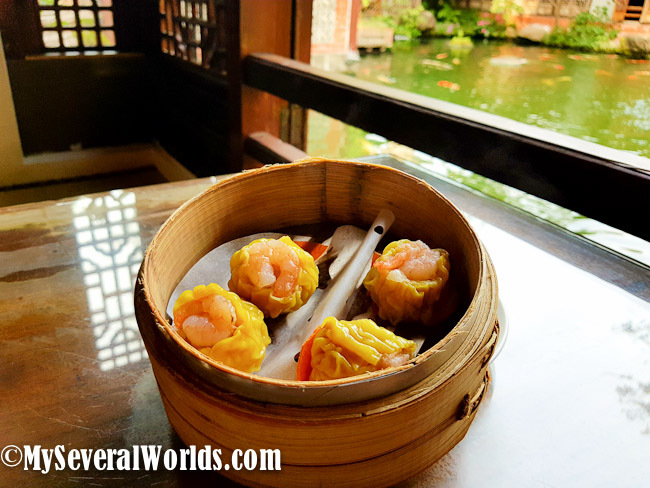 John ordered his favorite: Shrimp Xiao Mai. I don’t mind these, but he loves them, so I had one and he ate the rest. These are filled with rice and stuffed with shrimp. These are also really yummy. 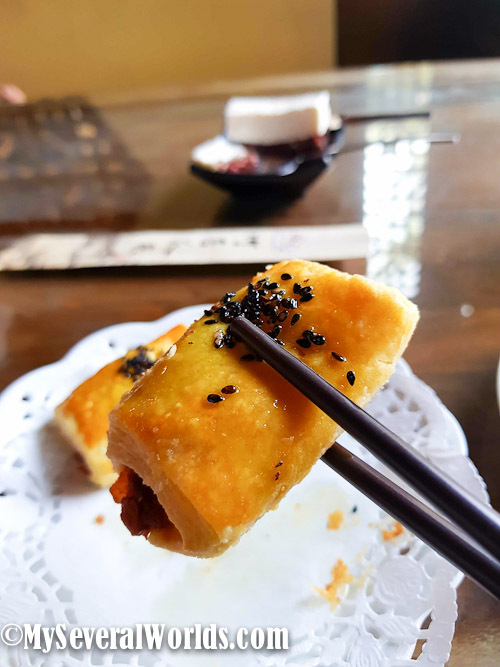 They’re stuffed with a red bean paste and deep-fried to sweet perfection. These are a type of spring roll. They’re not like the spring rolls we get back home in North America. 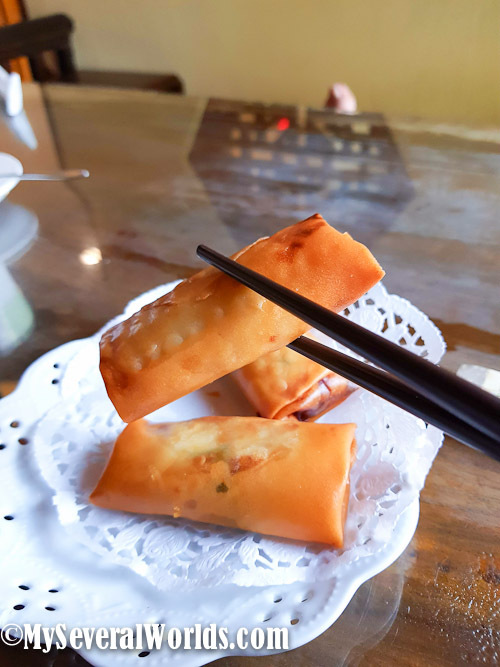 These are the closest that come to the idea of a North American spring rolls and, as you can see, they are not rolled, nor are they round. They’re pretty tasty though. This dish wasn’t a dish that either one of us were enthusiastic about. They gave it to us for free. It’s a red bean paste concoction. John didn’t try any, but I took a few bites and decided to eat my calories elsewhere. It’s pretty, but it was quite bland. I’m not a huge fan of anything with red beans in it, but people can’t get enough of red beans in China and Taiwan. Back to the fish! 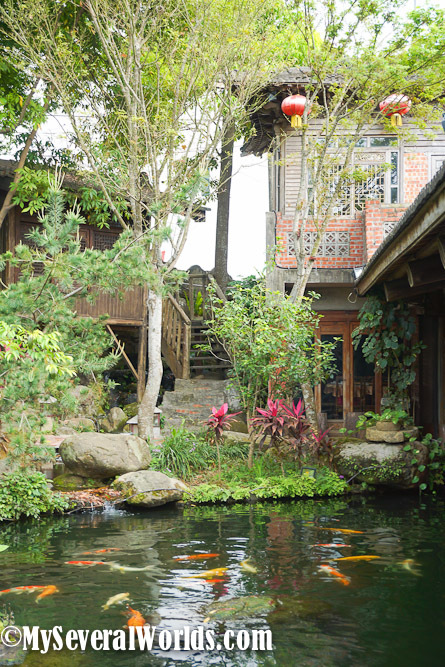 This photo was taken from our table which was overlooking the fish pond. 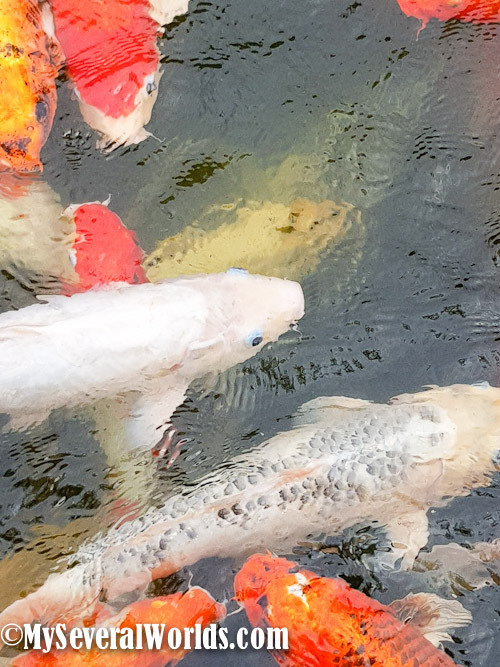 I was trying to keep my eye on that silver koi (Ogon), but there were so many fish there, it was hard to spot him after a while. 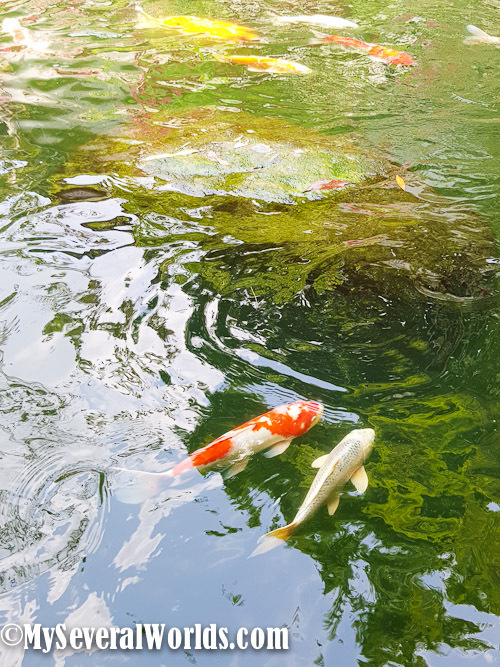 Just before we left, I spotted him again swimming alongside a white and red patterned koi (Kuchibeni) So there we have it, lucky in love and long-lasting relationships and lucky in wealth and business. What a nice note to leave on considering this was my husband’s idea for a romantic afternoon on our own. These fish are hungry. Here they are begging for food across the garden pond at another table. This is overlooking the back part of the garden and pond. This is an old part of history at the teahouse and it shows just how long it has been there. The story is that these grounds used to belong to a local family. They drew water from the well featured in the photo below. The well is over 100 years old and the water still runs deep and pure. You can also see that the teahouse has a lot of worn wood here. That is because the original structure has stayed intact. It lends to the authenticity of the place overall. The tables and chairs are worn down from visitors over the year, but that adds to the charm and appeal of this place. A local village used to draw from this well over a century ago, so the owner decided to keep it when he moved in and built his teahouse. He used much of the original standing structures and even kept the original bricks to the well barricade off so as to avoid further damage. The well is over a 100 meters deep and the water still runs deep and pure. You can see that the original wood on the walls, and even inside the restaurant’s tables and chairs has been worn smooth with use over the years. 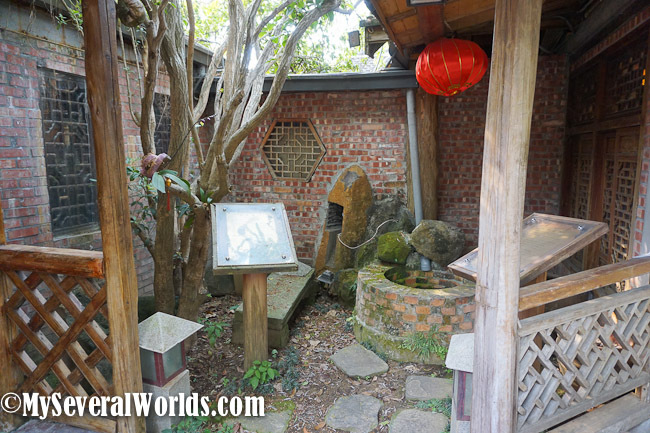 To the left of the well is a 100-year-old Osmanthus tree! These trees are known for their fragrant flowers which bloom in September and October. This is a tea tree, and it is associated with many traditions in China and Taiwan, with strong ties to the Moon Festival. 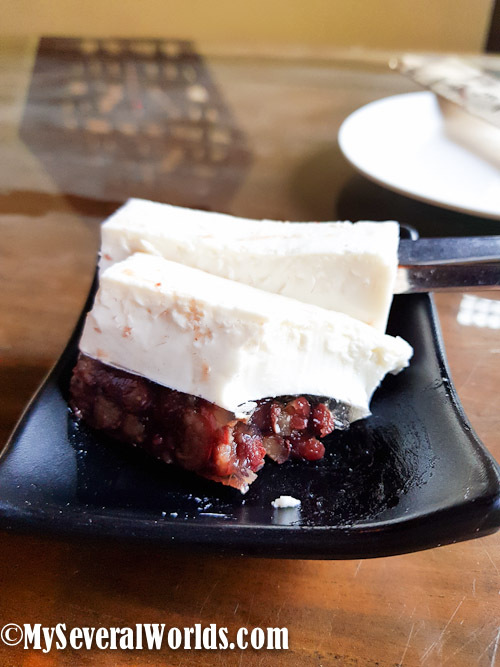 There is nothing more traditional than eating moon cakes in the moonlight under a flowering Osmanthus tree, while sipping on its intoxicating tea. It is said that the tea from Osmanthus trees is so fragrant, it can leave tea drinkers feeling slightly heady or even a little drunk on its sweet scent. Osmanthus trees are native to China and Taiwan, and in other parts of the world. This is the other side of the fish pond that I was facing while I was eating and playing with the fish. Guests here are given bags of food to feed the fish. We had so much fish food, we ended up giving the rest of ours to two kids as we were leaving. 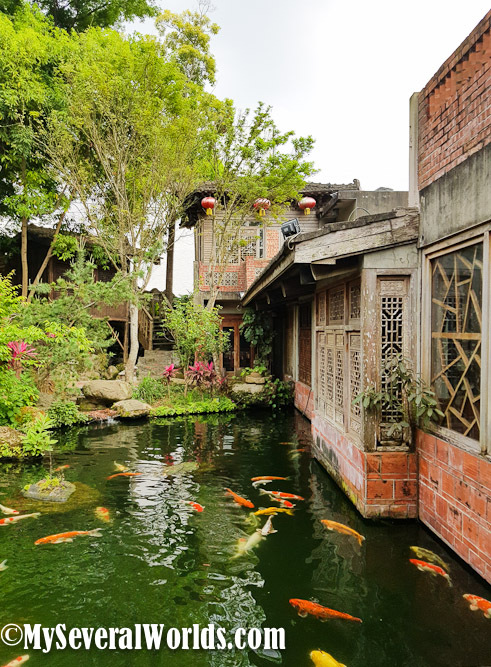 When you are enjoying the wonderful sights and delicious meals, the nishikigoi will swim around you, When you are visiting Chiayi, Jhu-Jiu Tea House in Daya Road is a must-visit spot.